The Arts District in Los Angeles is an industrial area of former warehouses and factories in Downtown LA that has been home to artist studios since the 1970's. It has finally reached the critical mass to be designated as the official Downtown LA Arts District. The artist studios and lofts are still mostly under the radar, although there are a few open studios and galleries. It is the murals, street art, maker co-ops and an influx of trendy eating establishments that have made the Arts District a "thing." The Downtown LA Arts District is located between Little Tokyo at Alameda to the west and the railroad yards and LA River to the east. It stretches south from Commercial Street to 7th Street with several different hubs of activity, mostly below 1st Street. Much of the art you will see on walls in the LA Arts District was not sanctioned by the City of Los Angeles, which imposed a moratorium on murals back in 2003. In defiance of the ban, and with the cooperation of the community and local businesses, the L.A. Freewalls mural project began facilitating the acquisition of walls for international and local artists to paint in 2009. Shephard Fairey (who also has a mural on the West Hollywood Library) was the first artist to participate in the project with his wheat paste mural "Peace Goddess" at 806 East 3rd Street. The project also included French artist JR and German twin brothers Raoul and David Perre was known as How and Nosm. As long as the murals stayed in the district, there wasn't too much objection, but the arts community continued to lobby for change and in 2013 the ban was lifted. Collaboration is a longstanding tradition in the LA street art world. Some works are created as one work by multiple artists, like the UTI Crew. Other walls are shared by separate artists or groups of artists and may or may not appear as a cohesive work. They may be different interpretations of a concept or totally unrelated. The transition from graffiti walls to more mural walls helped clean up the neighborhood, and more people started moving into the area, bringing more restaurants, and new businesses. Original residents worry about the current gentrification and the loss of fringe status. For the time being it's a mix of industrial grit and new upscale developments. In addition to the outdoor murals, you can buy art by notable street artists at LALA Gallery in the Willow Studios Building (1335 Willow St) and a variety of hand-crafted items from fashion and jewelry to bicycles at the Arts District Co-Op at Colyton and 5th Street. The sanctioned murals are usually protected for two to three years, and then they might be painted over. Unsanctioned murals may disappear sooner, so the murals currently on display may or may not be on the walls when you visit. The A+D Museum of Architecture and Design moved from Museum Row to 4th Street in the LA Arts District in 2015. The museum celebrates the progressive architecture of Los Angeles with exhibits, programs, and tours. There's also a cool artistic housewares shop inside the museum. Popular eating and drinking establishments in the north end around 3rd and Traction include the gritty Angel City Brewery with its giant JR eye mural that greets visitors, trendy German snack bar Wurstkuche, a branch of Umami Burger and the bustling café/bakery Pie Hole. Farther south, the industrial Italian Factory Kitchen on Factory, the French bistro Church and State on Mateo near 7th, Pour House Wine Bar, and the remote Villains Tavern on the east side at Palmetto and Santa Fe. There are several guided and audio tours available for the Downtown Los Angeles Arts District. 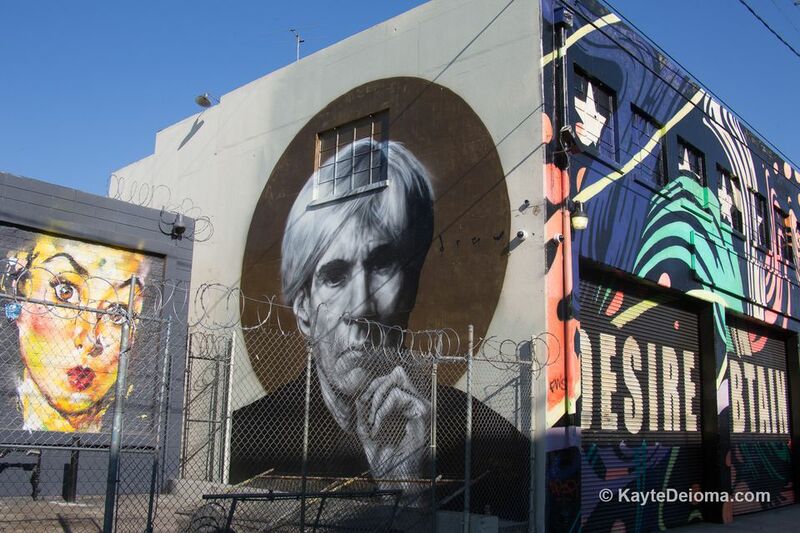 Art and Seeking offer private guided tours or a downloadable audio tour of the street art of the Downtown LA Arts District conducted by art professor Lizy Dastin. LA Art Tours offer regularly scheduled Downtown LA Graffiti and Mural Tours, as well as tours of other LA art enclaves like The Brewery and the Santa Fe Art Colony. Private tours are also available. Graff Tours offer guided group tours on Sundays. Cartwheel Art offers irregularly scheduled tours of the Arts District. The Mural Conservancy offers periodic group tours, but they're not on a schedule, so you have to sign up for their mailing list to find out when they're happening. All tours include a one-year membership in the Mural Conservancy. Six Taste offers food tours of the LA Arts District. The mural on the American Hotel in the Downtown LA Arts District is by the Black Light King and the UTI Crew. The UTI Crew has been painting in Los Angeles since 1986. UTI stands for Under the Influence -- of art. According to their Instagram account, it also stands for Unite to Ignite, Using the Imagination, and Utilize the Intellect. The American Hotel is a century-old residential hotel at the corner of Traction and Hewitt Street. It was home to renegade artists for decades before the district started becoming gentrified, and it still is. However, the iconic punk haven, Al's Bar that occupied the first floor for 21 years has been replaced by the trendy bakery ​The Pie Hole. On the back side of the American Hotel, "Abuelita" (the Grandmother) is a portrait of a Navajo weaver by El Mac. The geometric pattern above Abuelita was painted by Kofie and the lower left portion was painted by Joseph Montalvo AKA Nuke One of the UTI Crew. "Cream of the Crop," was painted first on the right by German twin brothers Raoul and David Perre known as How & Nosm and then the cartoon on the left was added by Australian couple Dabs & Myla, produced by Jet Set Graffiti for the LA Freewalls Project. See this while you can. Rumor has it that the new building owner isn't too fond of it. Lizy Dastin, art professor and owner of Art and Seeking Tours, discusses the contrasting paint styles and themes in "Redemption of the Angels," a mural by Christina Angelina of Los Angeles and Fin Dac of the United Kingdom. "A work like this is just as powerful and just as relevant as anything in a museum," says Dastin. "Redemption of the Angels" is located at 4th and Merrick streets at the foot of the 4th Street Bridge in the LA Arts District. The SCI-Arc Graduation Pavilion, aka "League of Shadows," designed by Marcelo Spina and his wife Georgina Huljich of the Silver Lake architecture firm Patterns, sits in the parking lot of the Southern California Institute of Architecture at the corner of 4th Street and Merrick in the Arts District. Shephard Fairey's "Peace Goddess" was the first work installed under the L.A. Freewalls project in 2009. It may soon be replaced by Fairey himself with a new mural covering the entire wall. You can find another Shephard Fairey on the Alameda side of the Angel City Brewery depicting Ronald Reagan holding a sign that reads "Legislative influence for sale." Unlike the "Peace Goddess," which is a wheat paste transfer, Ronald Reagan is painted directly on the brick. This photograph of eyes on the side of the Angel City Brewery is one of 14 paper and paste installations around Los Angeles as part of an international project called "Wrinkles in the City" by French artist JR. The Los Angeles murals, featuring the aging faces, eyes and sometimes hands of residents were installed in 2011 and 2012. Some of the pieces are already gone, replaced by something new. The bits of peeling paper on this one reveal the brick building below, adding to its character. Tristan Eaton's "I Was a Botox Junkie"
Tristan Eaton's mural, "I was a Botox Junkie," painted in 2013, was the second mural he painted on this same wall in the Downtown LA Arts District. He has another mural, "Peace by Piece" a couple blocks away at the Container Yard, painted in January 2015 which addresses the conflicts and debate around gun violence and gun control in the United States. The benefit of visiting the Los Angeles Arts District on the weekend is that many murals are painted when the large garage and warehouse doors are closed, like here on Pearce's Garage on 4th Street near 4th Place. During working hours, those doors are rolled up, so you don't get the full effect of the murals. 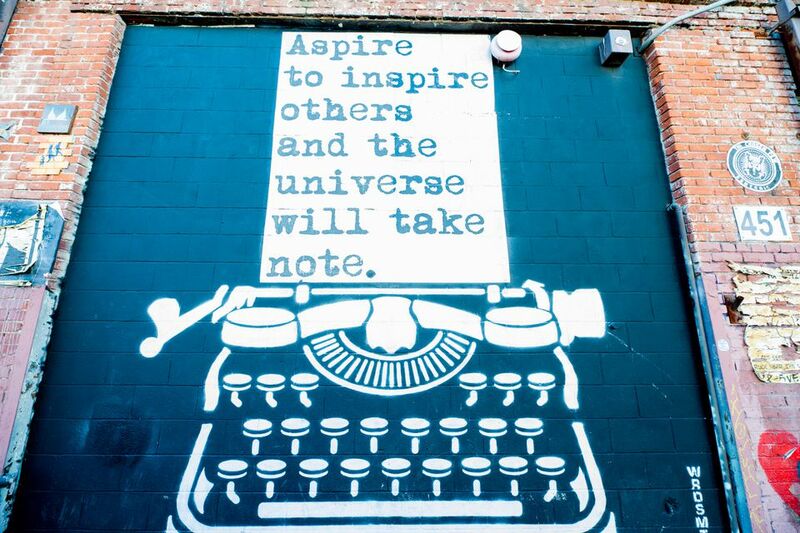 The surfaces in the Downtown Los Angeles Arts District are ever changing. New works are constantly popping up. Some are there for a fleeting moment; others endure. If you're lucky, you may witness part of the transformation, like this mural painted in 2015 by the Black Light King and the UTI Crew on a wall on Alameda near 4th Place. The A+D Architecture and Design Museum moved to the Downtown LA Arts District in August 2015. They host temporary exhibits related to progressive architecture in Los Angeles. The A+D Architecture and Design Museum hosts only temporary exhibits, but this exhibit on reinventing Wilshire Boulevard is an example of what to expect. It included creative fantasy buildings and landscapes that turned the iconic street into towers and even a crazy loop with upside down buildings. Some looked incredibly real and others just playful silliness. Looking for souvenirs of your trip to DTLA? You can find original art, crafts, and fashions in the Arts District Co-Op.